“Green with envy.” It’s a familiar phrase, but do you know where it comes from? It actually dates back to the 7th century when the poet Sappho used the word green to describe the complexion of a stricken lover. 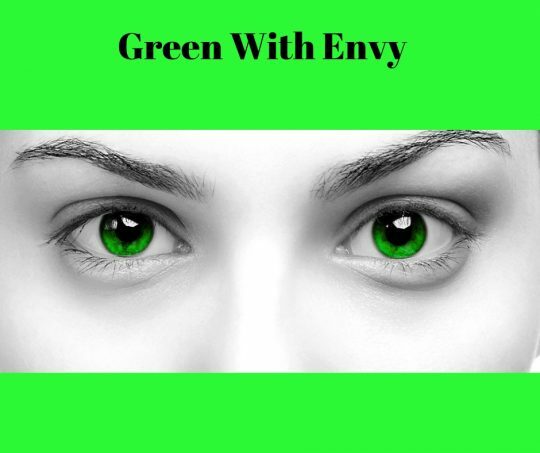 In earlier times, the Greeks believed that jealousy was accompanied by an overproduction of bile, the fluid secreted by the liver, which lent a green cast to a victim’s complexion. Centuries later, the villain Iago coined the phrase, “green ey’d monster” in Shakespeare’s play Othello: “O! Beware, my lord of Jealousy; it is the green-ey’d monster which doth mock the meat it feeds on.” Envy obviously has a long and storied history. Today’s Scripture lesson is a virtual case study in envy. The story centers on King Saul and an up-and-coming military commander named David. Everybody in this story loves David. The people of Israel and Judah love David (1 Samuel 18:16). The servants of King Saul love David (18:22). Even the family of King Saul is gaga over David. David and Saul’s son, Jonathan, are the best of friends, soul mates even. “Jonathan loves David as he loves his own soul,” we’re told (18:2). Saul’s daughter Michal loves David (18:20) and by the end of chapter 18, the two have married and David becomes Saul’s son-in-law. Verse 5 tells us that “David is successful wherever Saul sends him.” It seems he has “the Midas touch.” Of course, David is already renowned because of his defeat of the giant Goliath in chapter 17. Now, when David and his soldiers return victorious from battle, women pour into the streets singing and dancing to welcome the conquering heroes home: “Saul has killed his thousands and David his ten thousands,” goes the victory chant. Oops. That’s great if you’re David; not so much if you’re King Saul. This unfavorable comparison makes Saul angry—really angry. He interprets it as a slight, a personal insult. David is being heralded for the very things Saul was formerly commissioned to do. The king complains that the people “credit David with ten thousands and me with only thousands. Before you know it, they’ll be giving him the kingdom” (18:9). Saul fears that his popularity and influence over his people may be waning. The story ends with the fateful words, “Saul eyed David from that day forward” (18:9). Normally, the word “eye” appears as a noun in the Bible, but here it is used as a verb—the only place in Scripture where it is used this way. “Saul ‘eyed’ David” means that Saul kept a jealous eye on David, and the rest of 1st Samuel provides a commentary on this jealous eye syndrome. It’s not a pretty picture. In the verses that follow, Saul attempts to pin David to the wall with his spear on more than one occasion, and when one of the priests tries to stand up for David, Saul launches his spear in his direction, too. All because Saul has become insanely jealous of David. Envy ends up consuming the king. For Saul, it is a killer sin. Proverbs 14:30 says, “A heart at peace gives life to the body but envy rots the bones.” Envy rots Saul to his very bones, and it will rot us to the bones, as well. It is such a problem that one of the Ten Commandments addresses envy: “You shall not covet your neighbor’s house; you shall not covet your neighbor’s wife, or slave or donkey or anything that belongs to your neighbor” (Ex. 20:17) So, what is it about envy that is so dangerous, so deadly? Envy obsesses over what other people have. We are fine with what we have, with our piece of the pie, until we discover that someone else has a larger piece of the pie. Suddenly, we’re no longer satisfied with what we have. We want what the other person has. Envy acts out of the belief that achieving this one other thing will give us greater stature or happiness or fulfillment and not having it will diminish us in some way. It is a vice that affects people who are already highly successful and those who want to become successful; people who are wealthy and people who are not but want to be. Thomas DeLong, a professor at Harvard Business School, published a book in 2011 entitled, Flying Without a Net. In the book he writes about a disturbing trend he calls “comparison obsession.” He tells about one of his former students who, after graduating, had landed a terrific job at a Fortune 500 company. At least it seemed like a terrific job until she received her alumni newsletter and learned that a fellow alumnus, who had been in the Harvard MBA program with her, had just been named a Vice President at a Fortune 100 company. From that moment on, she could barely hold a conversation without bemoaning her lack of VP and Fortune 100 company status. On more than one occasion, she told people that she felt like a failure. That’s a picture of envy, and it’s not always business success, of course, that we compare. We compare relationships—is our marriage as loving or supportive as someone else we know? Or we compare kids, how our children measure up in academic, athletic or social prowess against others. Or we compare the ease, or lack thereof, of our life versus another’s or our health or appearance or the amount of stress we’re under. When we obsess about what someone else has and by comparison, feel we are holding the short end of the stick, envy has found a ready, fertile breeding ground. Envy is an emotion we don’t like to admit that we have. It’s one of those unmentionable sins which is understandable because admitting to feelings of envy doesn’t paint a very flattering picture of us. We don’t want to feel envious of the co-worker who gets the promotion, but we are. We want to be happy for the friend who gets engaged while we’re still single, but the truth is, we’re not. We know the sting of feeling what Mark Twain writes of when he says, “Few of us can stand prosperity. Another man’s, I mean.” We even know the shame of feeling a little bit glad when someone we envy encounters difficulty. In contrast, listen to the Apostle Paul who says with confidence and even joy, “I have learned in whatever state I am to be content.” The word “content” in this context refers to a Christ-centered sufficiency. Paul is saying that because he doesn’t have to rely only on himself, his contentment is not determined by his circumstances. No matter what situation he finds himself in, Paul relies on Christ to be his strength and to provide whatever he needs, and because of that, he is at peace.